I like the Memphis style of pork rib because it is seasoned with a dry rub for starters. Later, or rather optionally, you can choose to baste them with a mopping sauce (recipe included). Then you can serve with a traditional BBQ sauce if you so desire. Despite being a bit labor intensive, it only needs attention every 20 minutes or so, so you still have time to mingle with friends and family while the ribs are going. 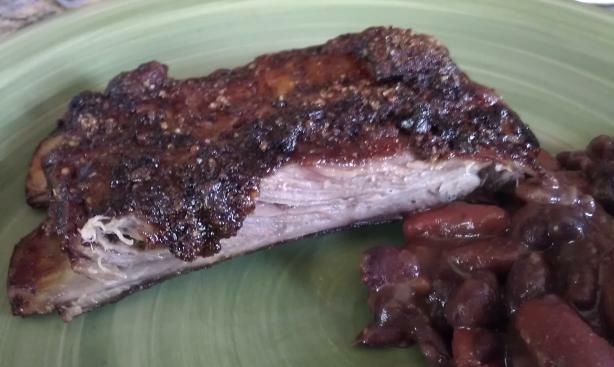 The reward is succulent, flavorful, and tender pork ribs. Set up your grill for indirect heating at 350 degrees F; place a drip pan in the middle of your coals. Use your hands to remove the silver skin from the ribs. Combine all the rub ingredients and rub 2/3 of it on both sides of ribs. Place ribs on the grill and close the cover. Combine all the ingredients for the mopping sauce. After 30 minutes of cooking, mop the ribs with the sauce; repeat mopping every 20 minutes thereafter. Continue to cook the ribs until they are tender and the meat has shrunk a bit from the bones, about 1 1/2 hours. Remove ribs from the grill, once they are done, and place on a cutting board; mop ribs one last time and sprinkle with remaining dry rub. Cut into serving size pieces as desired.